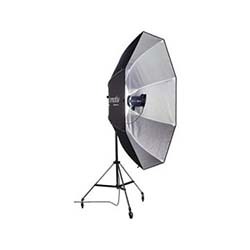 The large 74″ diameter surface area, wide coverage, and 360° Rotating System of the Elinchrom Octa Bank prompts many photographers to make it their only light source. Perfect for fashion and portraits, the Octa works to diffuse and even light spread as a prime example of the signature quality of light possible from this type of shaped modifier. The folding construction allows for fast setup, while the high output silver interior fabric works to diffuse up to 650W Halogen Lamp light. Rent daily or weekly with Bolt today!